A virtual machine scale set allows you to deploy and manage a set of identical, auto-scaling virtual machines. You can scale the number of VMs in the scale set manually, or define rules to autoscale based on resource usage like CPU, memory demand, or network traffic. An Azure load balancer then distributes traffic to the VM instances in the scale set. 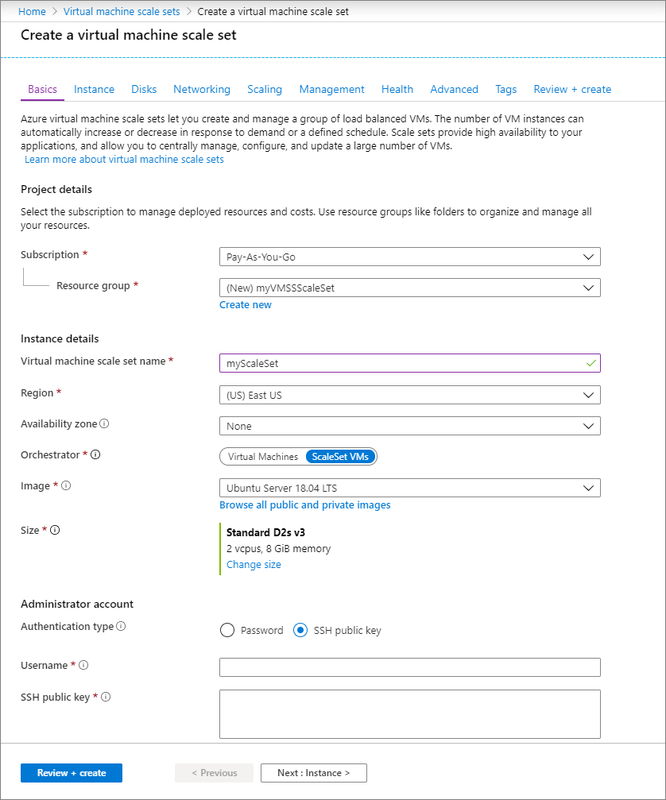 In this quickstart, you create a virtual machine scale set in the Azure portal. You can deploy a scale set with a Windows Server image or Linux image such as RHEL, CentOS, Ubuntu, or SLES. Click Create a resource in the upper left-hand corner of the Azure portal. Search for scale set, choose Virtual machine scale set, then select Create. Enter a name for the scale set, such as myScaleSet. Select your desired OS type, such as Windows Server 2016 Datacenter. Enter your desired resource group name, such as myResourceGroup, and location, such as East US. Enter your desired username, and select which authentication type you prefer. A Password must be at least 12 characters long and meet three out of the four following complexity requirements: one lower case character, one upper case character, one number, and one special character. For more information, see username and password requirements. If you select a Linux OS disk image, you can instead choose SSH public key. Only provide your public key, such as ~/.ssh/id_rsa.pub. You can use the Azure Cloud Shell from the portal to create and use SSH keys. Select a load balancing option, such as Load balancer, under Choose Load balancing options. Enter the remaining details for your load balancing option. For example, for Load balancer you need to enter a Public IP address name and Domain name label. Enter the virtual network details under Configure Virtual Networks. For example, you can create a new virtual network, myVirtualNetwork, and a new subnet, default. To confirm the scale set options, select Create. When you create a scale set in the portal, a load balancer is created. Network Address Translation (NAT) rules are used to distribute traffic to the scale set instances for remote connectivity such as RDP or SSH. Select the resource group you created in the previous step, such as myResourceGroup. From the list of resources, select your Load balancer, such as myScaleSetLab. 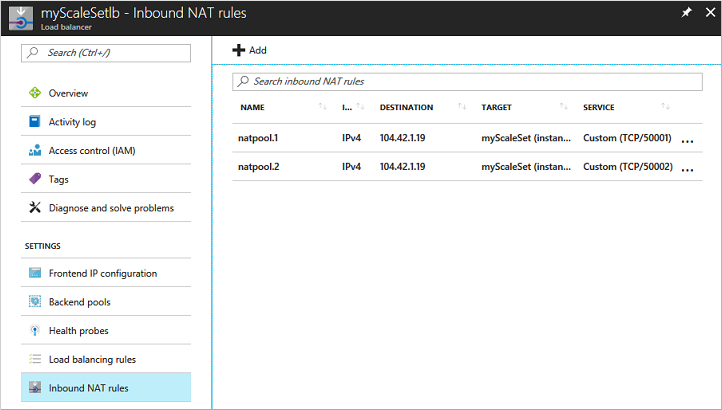 Choose Inbound NAT rules from the menu on the left-hand side of the window. When no longer needed, delete the resource group, scale set, and all related resources. To do so, select the resource group for the VM and click Delete. In this quickstart, you created a basic scale set in the Azure portal. 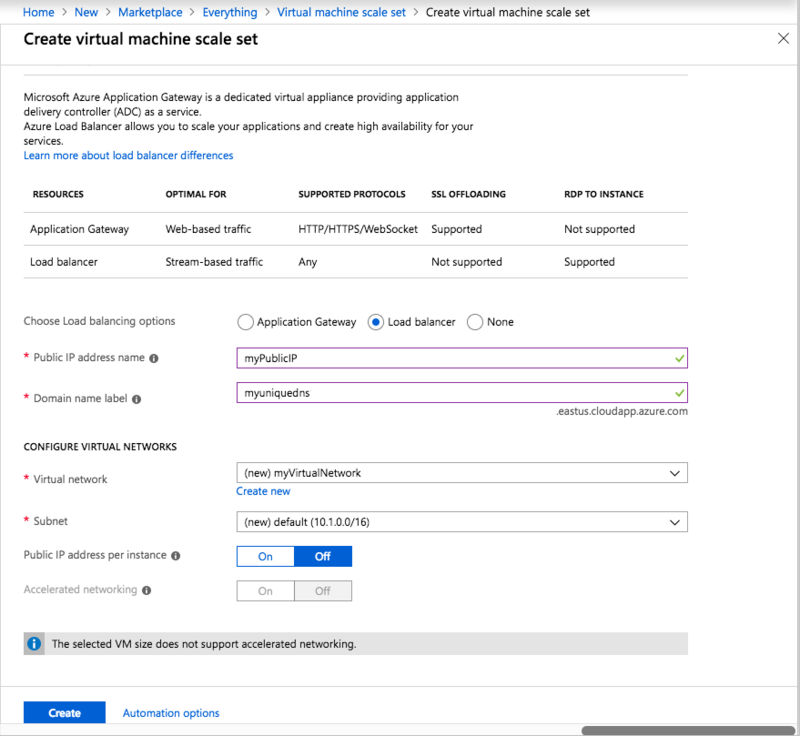 To learn more, continue to the tutorial for how to create and manage Azure virtual machine scale sets.